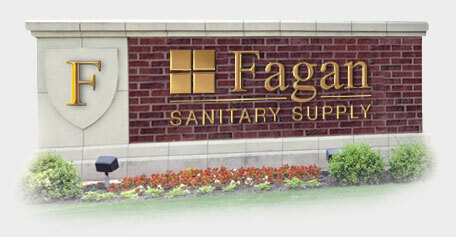 Fagan Sanitary Supply is a distributor of high quality janitorial supplies and equipment located in West Elizabeth, PA and serving the tri state area. We excel at assisting our customers with facility maintenance, management, training, and consultative services. Fagan Sanitary Supply understands that keeping a facility clean is much more than buying cleaning supplies and equipment. It’s about improving processes, making it easier for your staff to get the job done right with the best results. Our main chemical product line is Hillyard Inc. Hillyard has 100 years of experience at manufacturing high quality cleaning products and is number one in gym floor coatings. Working for Hillyard Inc., Larry Cullen and Larry Fagan amassed over 35 years of servicing customers prior to opening Fagan Sanitary Supply as a distributor in 2002. They passed down to the next generation, their expertise in helping customers gain the highest level of appearance, health, and safety in their facilities. The pride, quality, knowledge, and customer service is still evident at Fagan’s today. We have developed a top notch team of committed, industry educated professionals who strive to perform at the highest levels in the industry. We can help you improve productivity within your budgetary guidelines saving you time and money. We understand that 86% of your cleaning budget is spent on labor. We strive to train you and your staff on simplified, standardized cleaning processes to make their jobs easier and less time consuming. We will suggest equipment and cleaning methods to improve productivity and cleaning quality. We offer chemical management systems that produce less waste, have a lower end-use cost, and are safer for employees. We are floor care experts and we will help you extend the life-cycle of your floor finishes.